We’d love your help. Let us know what’s wrong with this preview of When the News Went Live by Bob Huffaker. To ask other readers questions about When the News Went Live, please sign up. On November 21, 1963 President John F. Kennedy arrived in Texas for a two day visit, which was designed to bring together the liberal and conservative wings of the state's Democratic Party, and to gain support for Kennedy's planned campaign for re-election the following year. After successful visits to San Antonio and Houston, President Kennedy and Jackie, his lovely and even more photogenic wife, spent the night in Fort Worth. On the following day, Kennedy gave a breakfast speech in front of hu On November 21, 1963 President John F. Kennedy arrived in Texas for a two day visit, which was designed to bring together the liberal and conservative wings of the state's Democratic Party, and to gain support for Kennedy's planned campaign for re-election the following year. After successful visits to San Antonio and Houston, President Kennedy and Jackie, his lovely and even more photogenic wife, spent the night in Fort Worth. On the following day, Kennedy gave a breakfast speech in front of hundreds of supporters there, then made a short flight to Dallas, where he was to give another speech at the Dallas Trade Mart after a motorcade through the heart of the city. Dallas had acquired a reputation for extreme right wing activity in late 1963, particularly after United Nations Ambassador Adlai Stevenson was heckled, spat on, and struck on the head by a picket sign after a speech he gave there on UN Day, barely a month before Kennedy's planned visit. Several of Kennedy's closest advisers urged him to cancel the Texas trip, or at least his visit to Dallas, as they feared for his safety. However, the President, looking ahead to the 1964 campaign, felt that it was more important to proceed with this visit. Friday November 22nd was an unusually warm and rainy day in the Dallas-Fort Worth area, but by the time Air Force One landed at Love Field the skies had cleared, and the decision was made to remove the bubble top of the presidential limousine, to allow the hundreds of thousands of Dallasites who gathered on the well publicized motorcade route to get a glimpse of the Kennedys as they proceeded from the airport to the Trade Mart. Television was still in its early stage in 1963, particularly in its coverage of live events. Broadcast cameras consisted of two main types, bulky shoulder models which could capture images but not sound, and even larger ones that had to be connected to news trucks by thick wires, which took many minutes to warm up before they were ready for use. Film from cameras had to be carried back to the news studio for processing, as the use of satellites was at a primitive stage. As a result, most Americans received news coverage via newspaper and radio, until that fateful weekend. Most of Dallas's local media were out in force to cover the President's visit, including the staff of KRLD, the city's CBS television and radio affiliates. As the news was announced that three shots had been fired at the presidential motorcade and that Kennedy and Texas Governor John Connally had been seriously wounded, local and national reporters and cameramen headed en masse in a mad scramble to Parkland Memorial Hospital, where the men were taken, and the Texas School Book Depository, where the shots were fired, while others reported from the Trade Mart as the crowd learned with horror what had taken place. When the News Went Live is an excellent set of descriptions of the events on that tragic day in November, the subsequent arrest of Lee Harvey Oswald, his assassination by local club owner Jack Ruby two days after the president was cut down, Ruby's trial the following year, the effect that the two shootings had on the reputation of Dallas and the United States, and an analysis of how news coverage has changed in the nearly 50 years since then, as told by four members of the KRLD staff: Bob Huffaker, the television reporter who became known to millions of Americans as he described the shooting of Lee Harvey Oswald at the Dallas City Jail live on CBS Television; Bill Mercer, who was present during the midnight news conference on Friday where Oswald was interviewed by reporters from all over the world; George Phenix, a newly minted news photographer who captured images at Parkland Memorial Hospital, Oswald's assassination, and Ruby's trial; and Wes Wise, the reporter who was approached by Ruby on the day of Kennedy's assassination, who later became mayor of Dallas, and was instrumental in helping the city's residents heal from the tragedy and in restoring its national reputation. Huffaker, the author of many of the book's chapters, provides an excellent background of Dallas leading up to the shooting, first hand descriptions of the weekend's events with information that was new to me, and balanced analyses about the city's conservative and extreme right wing elements, along with rebuttals to the misinformation that came out about Dallasites after the shooting, especially the grevious and incorrect report by CBS News that schoolchildren had cheered when they learned of the president's assassination. Huffaker also compares the role of the media in 1963, when most cities had three major television stations and limited ability to cover breaking news stories, and the present day, in which cable news stations provide "strident hypercoverage of celebrity murder and scandal". The book closes with prescient comments by all four men, which provides a superb closure. Bob Huffaker, along with Bill Mercer, George Phenix and Wes Wise were reporters for KRLD in Dallas in November 1963 when JFK was assassinated in their city. The authors provide their recollections of the day and the aftermath of the assassination in a way that is forthright and telling. It is a first person account that needed to be told before their particular voices are lost to history. They take care to let us know what it meant to be a reporter in 1963 and you were more than just a talking h Bob Huffaker, along with Bill Mercer, George Phenix and Wes Wise were reporters for KRLD in Dallas in November 1963 when JFK was assassinated in their city. The authors provide their recollections of the day and the aftermath of the assassination in a way that is forthright and telling. It is a first person account that needed to be told before their particular voices are lost to history. They take care to let us know what it meant to be a reporter in 1963 and you were more than just a talking head; you had to write and edit your own copy and any audio or video they shot. These men were reporters who literally had their hands in the entire news process from front to back. Along the way, we also get a look behind the scenes at how these men utilized their contacts within the Dallas PD to get background information on their stories and how they did it in a manner that respected their sources. By contrast, we also have evidence that the 21st century news media does not have a monopoly on crafting a narrative with which to frame a story. Dan Rather - the purveyor of the forged George H. Bush Air National Guard documents - went and ran with a story about the children of one Dallas elementary school cheering when JFK's assassination was announced. This was made to appear that Dallas was "a city of hate". It turns out, the cheers were because they were being let out of school early; a reason for which any school-age child would cheer. Similarly, noted CBS commentator Eric Sevareid is faulted for relying on his research staff who spoke with one of the authors several times about Oswald's murder, yet none of that information made it to Sevareid's commentary that day. A major weakness of the book is the authors' seeming bias against conservatives. The authors frequently use terms like "arch-conservative", "rabid right winger" and the like; yet no liberal is given similar terms. In their end commentaries on the media today, they make many sideways remarks about Fox News, either expressly or implied using their slogan "Fair and Balanced". In my opinion, this takes away from their objectivity and as such causes me to de-rate the book by one whole star. Here, finally, is the view from the street about November 22, 1963. This reporters’ account of the Kennedy assassination brings to full focus the personal anguish as well as the professional pressure endured that day by those who could not take the time to cry. This book will become part of the real and permanent history of a dark day for America. The first accounts of how the Kennedy assassination happened came from the local radio and TV reporters of Dallas. For the first time, some of the best of those reporters tell the gritty tale of how they did it. The story they tell is riveting, insightful and filled with new detail about that awful weekend that changed America. People often ask me "what it was really like" to be in Dallas on the day Kennedy was shot. . . . When the News Went Live provides an eloquent answer to that tough question, as four newsmen who were there, on the ground, tell how it "really was" through their eyes and ears. This book has more legs than the Rockettes. The slim page-turner possesses a crisp, objective quality that, like a good movie, never stops moving. This work brings immediacy and intensity to events that shook the nation. You are there with the four, on the streets, at the hospital, along the flower-strewn Grassy Knoll the day after, in the jail as Oswald is paraded for the press and then for murder live on TV. Interwoven with this is the perspective of forty years from men grown old, who still live with November 1963. The integrity and dedication of these four veteran journalists is impressive, as is their ability to make a 40-year-old event come alive again.
. . . a fast-paced recounting of what they witnessed. . . . It concludes with two thought-provoking chapters about the business of news and its uncertain future. Recommended for academic and public libraries devoting space to journalism. Their account of reporting the events surrounding Kennedy’s death goes beyond mere retelling, reflecting on issues such as ethics and duty in the presentation of news.
. . . more than just a compelling read. It is an account of incredible from-the-streets reporting of history. . . . Each author has a chance to share individual memories, and readers will appreciate the opportunity to read transcripts of live reports, such as Huffaker confirming the assassination by saying, "This is one of the quietest crowds that will ever assemble—the crowd with pity, sorrow, horror and shame in its heart." No less moving is Huffaker explaining to us 42 years later, "I hated having to speak when I felt like weeping." If you are going to read one book about the events of November 22, it might as well be this one. It is a great book. Powerful stories. A first-class account of a tragic historic moment that still has an impact on our nation. A riveting account not only of the assassination but of TV’s transformation into America’s most dominant news source. In those terrible days they shared a common bond to report the news as they lived and witnessed it. Forty years later and still committed to the same principle, they offer the reader . . . a fascinating text. Now they take us live and in living color back to those blood-dimmed days in Dallas. A stunning set of recollections. Tells of a time when the American public lost its innocence, and the authors in the last section of the book give us their perspectives on the changes in the news media that have taken place over the last 40 years. It is always helpful to get a look back to see how we got to where we are today, and these gentlemen have done an excellent job of that in light of the Kennedy assassination. This thoughtful and fast-moving account by four Dallas broadcast reporters is respected by journalists for its depth, authority, and readability. Their vivid first-person story is the most detailed view yet of the JFK assassination and its aftermath. From interwoven viewpoints at the center of that tragedy, they show what really happened, how they covered the stunning events for the nation, and how broadcast news has developed since, both technically and ethically. Bob Huffaker, Bill Mercer, George Phenix, and Wes Wise reported for the CBS affiliate KRLD Radio-TV News, one of America’s top news operations. They worked with Dan Rather, Walter Cronkite, and CBS to bring Texas news to the nation. When broadcasting JFK’s Dallas visit suddenly evolved into reporting a worldwide tragedy, they kept as calm as possible, to encourage the world to remain sane. http://amapedia.amazon.com/view/John+...+% 28Twayne%27s+English+Authors+Series%29/id=710 5 22 . Bill Mercer, author of Play-by-Play: Tales from a Sportscasting Insider, kept vigil at Dallas Police headquarters and confronted Oswald in a midnight press showing, where he informed the assassin that police had charged him with the president’s murder. Among flowers at the assassination site, Mercer reported words of sympathy on wreaths—and on the minds of those who gathered in grief at JFK’s murder. Voice of the Dallas Cowboys, Chicago White Sox, Texas Rangers, University of North Texas, and the Cotton Bowl, Mercer is in the Texas Radio Hall of Fame, Texas All-Pro’s Hall of Fame, and UNT Athletic Hall of Fame. He gained fame announcing wrestling and wrote history of the Navy LCI: World War II combat landing craft on which he served in the Pacific. George Phenix has made his mark in press and politics. For two decades he published Texas Weekly, the premier newsletter he founded. After the assassination, Phenix left KRLD to lobby for the Texas Municipal League, and he wrote speeches and television shows for officials including Governor Preston Smith and Congressman J.J. Pickle. After four years as Pickle’s Washington aide, he returned to Texas as Executive Assistant to US Senator Lloyd Bentsen, published several weekly newspapers, and remains an authority on politics and journalism. His widely read Blog of Ages deals with a broad range of subjects and opinions: http://www.blogofages.net. 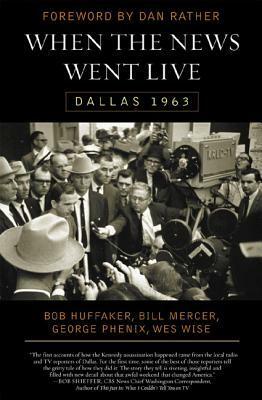 The authors were all on-the-scene reporters from television news station KLRD in Dallas who covered the assassination of President Kennedy and its aftermath. Most of the reviewers consider it a book about the assassination and the subsequent killing of Oswald and trial of Jack Ruby. It does give a first-hand, reliable, and professional account of all of those events, but that's not what the book is about. It's about journalism. The events of that day were what really brought the American public t The authors were all on-the-scene reporters from television news station KLRD in Dallas who covered the assassination of President Kennedy and its aftermath. Most of the reviewers consider it a book about the assassination and the subsequent killing of Oswald and trial of Jack Ruby. It does give a first-hand, reliable, and professional account of all of those events, but that's not what the book is about. It's about journalism. The events of that day were what really brought the American public to the world of TV news as their primary news source. Before that, people mainly relied on their local newspaper. This book describes in fascinating, sometimes excruciating, detail what it was like to be a television newsman in those days. I was amazed at how versatile they had to be: able to work any of several different cameras, both film and still, then develop, edit and splice the film, write copy timed to match the film, then record it, conduct good interviews, act as sound engineer, hold a boom mike for another reporter, serve as on-air "anchor", report the weather or sports if needed, develop sources with the police, fire, emergency rooms, city hall and elsewhere. They did all this in a milieu of chaos and bedlam during those days and week in Dallas, 1963. I just spent a week in Dallas on business and spent some time in Dealey Plaza to reflect. I notice the crowds are much larger now than when I was here last some seven years earlier. The numbing curiosity never seems to fade, which I believe is so good sign. While there I visited the Museum store across the street from the School Book Depository. First I highly recommend; a terrific eclectic collection that includes an ice cream/soda shop! The workers were very knowledgeable and they recommended I just spent a week in Dallas on business and spent some time in Dealey Plaza to reflect. I notice the crowds are much larger now than when I was here last some seven years earlier. The numbing curiosity never seems to fade, which I believe is so good sign. While there I visited the Museum store across the street from the School Book Depository. First I highly recommend; a terrific eclectic collection that includes an ice cream/soda shop! The workers were very knowledgeable and they recommended this as the best writing on what it was like to be in Dallas during the time of the shooting. This is written by four reporters/photographers that covered the events. If you are looking for conspiracy theory writings, they have other recommendations. This is a first person view on the assassination of president John F. Kennedy, the death of his killer, the trial of his killer's killer, and everything inbetween. It tells us everything as the reporters reported it. We learned what it was like being there as all of these things happened, how these events were reported, and what it was like reporting about them. At parts, I found this book hard to read and it seemed to go on very slow but most of the time I was very happy with it. I would recomm This is a first person view on the assassination of president John F. Kennedy, the death of his killer, the trial of his killer's killer, and everything inbetween. It tells us everything as the reporters reported it. We learned what it was like being there as all of these things happened, how these events were reported, and what it was like reporting about them. Provides first person perspective on JFK's assasination and following events from the reporters who were covering it. Gets a little dry and wordy toward the end. Nothing new here. First hand account of journalists covering the story. Similar to making documentaries out there. This book was cruising along nicely and then grind to a halt with a laborious trudge through the weeds of the Jack Ruby trial. I was so tempted to skip those never-ending pages but then I couldn’t say “Yes I read that book”. I will say that it rebounded with the final chapters of each author’s opinion of today’s news compared to 1963.